Travel to your concert in Vienna by nostalgic Fiaker carriage. Rent charter buses in Vienna. The Vienna Hofburg Orchestra - consisting of about 40 professional musicians and internationally renowned soloists of the Vienna State Opera and Vienna Volksoper - plays, from April to October, opuses from Johann Strauss and Wolfgang Amadeus Mozart in the Festsaal and the Redoutensaal of the Vienna Imperial Palace. 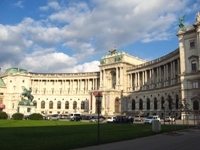 Compositions such as "Emperor Waltz", "The Blue Danube" and extracts from "The Bat" (also known under the German name "Die Fledermaus"), "The Gypsy Baron" and "The Magic Flute" are performed by the Vienna Hofburg Orchestra in Hofburg Palace. And to crown it all, you can also enjoy the world-famous "Radetzky March", composed by Johann Strauss I. Bank transfer payment: please visit the webpage "Concert tickets booking" and you will find our order form for concerts in Hofburg Palace. Print, complete and sign the order form before faxing it to the team of Austria Concerts at the given number. Afterwards, you will receive your bill and all the information you might need. or by phone at +43 1 966 02 61 (from Monday to Friday - from 9 a.m to 5 p.m). We are looking forward to hearing from you!
. Hoping to read from you soon!
. We will be delighted to help you!